How many brands can there possibly be in the pool equipment industry? A lot, as it happens. Fortunately, you have us on your side. Pentair and Jandy are two big names you'll see when you're researching pumps and filters for your inground pool. It can be tough to see the differences in their products, especially if you're new to the pool scene. Welcome to our guide comparing Pentair's and Jandy's similar cartridge pool filters. As a reminder, the 3 types of pool filters are cartridge, sand, and D.E. filters. 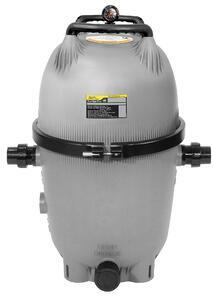 Sand filters: The sand in the tank catches dirt and debris that's 20 microns and bigger. Diatomaceous Earth (D.E.) filters: A set of grids/fingers is coated with crushed seashells and fossilized diatoms, and they catch dirt and debris that's 5 microns and bigger. Today is Part 1. Let's talk about their cartridge filters! The Pentair Clean & Clear Plus cartridge filter works for pools containing 43,200 to 108,000 gallons of water (depending on the model). 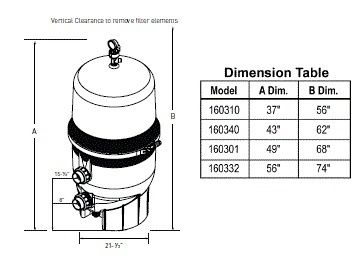 Filtration area options: 240, 320, 420, and 520 sq. ft. Reminder: This refers to the surface area of the filter media—in this case, the pleated polyester in the cartridge, which does the actual filtering. For more details, check out What Does a Pool Filter's Filtration Area Mean? Weight: 60, 70, 80, and 90 lb. Warranty: On the Warranties page, Pentair warrants their products to be free from defects in material and/or workmanship for a period of sixty (60) days (parts only) from the original date of purchase and/or installation. They also warrant their filters specifically for a year. The filter requires 4 cartridges. It catches dirt and debris as small as 20 microns. The Clean & Clear Plus filter uses coreless cartridges, so when you pull them out to clean, you can get right to the center. Easy peasy! It has a high flow manual air relief valve. It's a single-piece base and body design. Its inlet and outlet ports are on top of each other, not on opposite sides of the filter. It has a clamp ring for quick access to cartridges. The Jandy CV cartridge filter works for pools that contain 45,720 to 72,000 gallons of water (depending on the model). Note: Amazon lists this filter as the Zodiac CV Series Versa Plumb Cartridge Filter. Same difference. 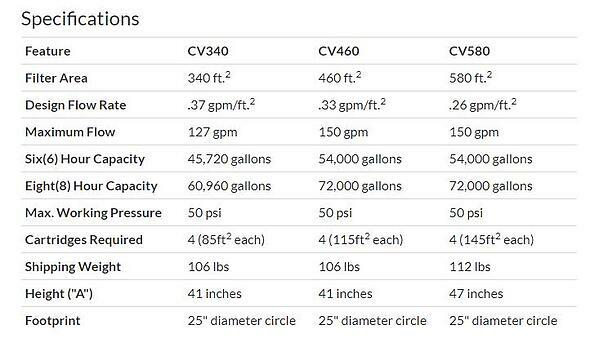 Filtration options: 340, 460, and 580 sq. ft. Reminder: This refers to the surface area of the filter media—in this case, the pleated polyester fabric in the cartridge, which does the actual filtering. Plumbing size: 2" x 2½"
Weight: 106, 106, and 112 lb. Warranty: In the CL and CV Installation and Operation Manual, Jandy warrants that the CV cartridge filter will be free of manufacturing and workmanship defects for a year. It was difficult to find the manufacturing warranty specifically for the CV filter series. Zodiac owns Jandy, but Zodiac's limited warranty doesn't mention filters at all, much less specify the CV series. The tiny print generalizes "all Zodiac® brand products (including those branded as…Jandy®)"—but the accompanying list of equipment and brands/models left me questioning whether this warranty actually included the CV filter after all. After what felt like an eternity of link-clicking, I found the specific warranty at the end of the installation/operation manual. This doesn't necessarily mean it's a bad product, but companies look better (read: more trustworthy) when their warranty is clear and easy to find. In all my research, Jandy never specifies how many microns it catches in dirt and debris. That's not a great sign. It has a heavy-duty, anti-corrosion tank clamp and easy-grip handles. Its inlet and outlet ports are at the same height/level on opposite sides for hydraulic efficiency. Both brands' filters require 4 cartridges, have a one-year warranty, and max out at 50 psi. Pentair Clean & Clear Plus sizes are slimmer and lighter but almost always taller than Jandy CV equivalents. Jandy's drain is a half-inch bigger, and its inlet and outlet ports are at the same height/level (hydraulic efficiency). The filter's micron-catching abilities are apparently a secret. Pentair offers more size options, costs less for similar sizes, and is open about its 20-micron minimum. It also has a clear warranty and receives higher reviews from customers. Interested in a fiberglass pool? We'd love to help you figure out the best pool plan for you and your family! Once you drop us a line, we respond within 48 hours (and we'll never spam you with a million emails or calls). You can also check out our YouTube channel and our Ultimate Guide to Inground Swimming Pool Maintenance. We want to help you make the most of your pool! Next: Is Pentair Sand Dollar or Jandy JS Side Mount Sand Filter Better? Editor's note: This blog article was updated on October 30, 2018.